Q. 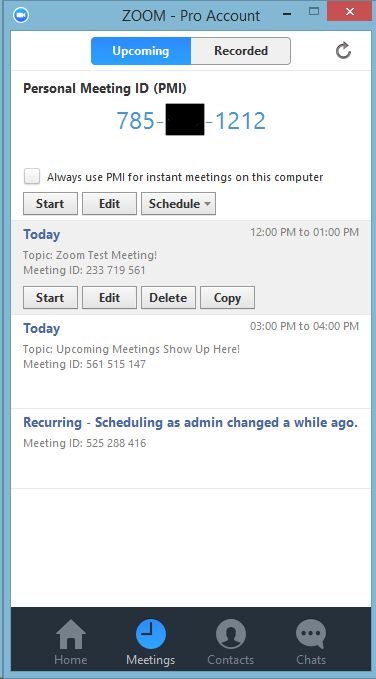 How do I use the Meetings tab on the Zoom home screen? Select "Meetings" to view, start, edit, and delete your personal meeting ID, scheduled meetings, and recorded meetings. Click here for more information on Personal Meeting ID(PMI). Start: Selecting start will start the pre-scheduled meeting that you have listed in your upcoming meetings. Edit: You can edit or update your scheduled meeting. Delete: Selecting delete will permanently delete your scheduled meeting. Copy: Here you can copy your scheduled meeting(s) invitation text and manually paste into an email, IM, SMS etc. Note: if you do not see your scheduled meeting, click the refresh tab in the upper right-hand corner to update/refresh the meeting list.